Steering Head Bearings - a Honda design flaw? The steering head bearings consist of two ball races, in much the same layout as on a bicycle. It seems ridiculous that such a design takes the strain of the full weight of a 290-odd kg motorcycle, plus rider, plus all the forward weight transfer when the brakes are applied, but it works. But what on earth were Honda thinking? Why oh why did they use normal ball bearings? I'd only done around 38,000 miles when I took the Pan in for its annual MOT test (an MOT is an annual certificate of roadworthiness in the UK, without which you won't get insurance or your annual vehicle licence disk). It failed. Reason? "Steering head movement 'notchy'". See those regularly-spaced dark spots around the groove? That's wear, caused by the pressure of the ball bearings. If you think about it, the contact point between a sphere and a flat surface is very very small indeed. And the smaller the surface area, the greater the pressure. Couple this with the fact that when riding, the handlebars are always in one position (you don't of course turn the handlebars to change direction), it's not surprising that wear occurs, as the pressure of the ball is always in the same place. The solution is to use tapered roller bearings. Whereas common roller bearings only support radial loads, the taper angle supports both radial and axial loads. 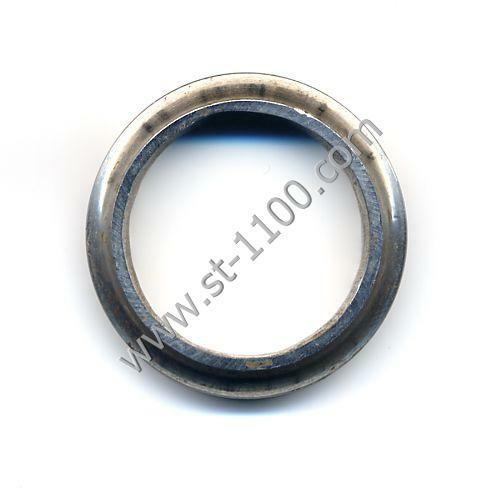 And because the contact point between a cylinder and a flat surface is larger than that between a sphere and a flat surface, the bearing can not only cope with greater loads, but will last a lot longer. I therefore obtained a set of tapered roller bearings which were direct replacements for the OEM bearings. As with any bearings that I install, I pack them with good quality multipurpose grease first. Whilst the forks were off I decided to change the fork oil at the same time. All the details of how to do this are in the Haynes manual, so I won't repeat it all again here.